Traveling to Turkey? Looking to visit some of the most incredible sites in the world? Feast your thoughts on a rare itinerary that is not often presented to travelers dreaming of an impressive private blue cruise along the deep blue Aegean shores of Turkey to the Marmara Sea. This journey is 2 wonderful weeks long. Why not combine this holiday cruise at the start or after the end of your land travels in ancient Anatolia. One way to integrate your travels in Turkey is to start from Istanbul with a land tour and work your way to Bodrum; or in reverse where your Aegean blue cruise holiday can begin from Bodrum harbor and end in Istanbul. Then, you and your group could continue with your land excursions in Istanbul and other parts of Turkey. 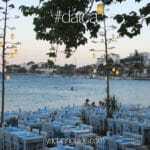 Bodrum, Gulluk, Didyma, Kusadasi, Cesme, Foca, Dikili, Ayvalik, Burhaniye, Akcay, Bozcaada, Gokceada, Canakkale Strait, Gallipoli (Dardanalles), Avsa Island (Marmaris Sea), Marmara Island, along the Bosphorus to Istinye. There are few things to keep in mind with this route. It is a very desirable route, but as you are heading upwards to the Northern Aegean, the sea conditions are different from the Mediterranean. The waters are cooler and may be a bit rougher. As such this trip in travel time fort he guests is minimum 2 weeks long. 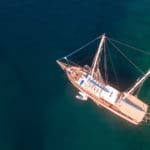 As this is a long journey, a gulet no less than 30 meters is highly advisable – and that is minimum. 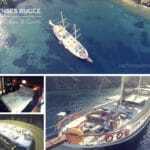 More ideally, gulets from 32 meters and up are not only more comfortable, but also sturdier for such sea travels – especially in the Northern Aegean sea. To save time, a motor yacht may be considered for this route, since they are faster than gulets. Private marina fees are NOT included. Please keep notice when moored in certain areas for this or check with your captain beforehand. Harbor taxes and mooring fees in Greek waters • Airport transfers • Meals, soft drinks, bottled water, alcoholic beverages • Land excursions • Insurance does not cover your own personal travel and cancellation insurance. Greek waters entrance fees and Greek islands harbor fees will be paid to the captain on board if cruising around Greek islands. Charter rates start at 25,000 EUR. 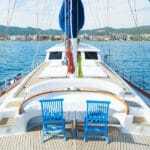 Interested in a Bodrum to Istanbul Private Blue Cruise Holiday? Please contact us for more details and information, along with any questions that you wish to ask regarding this beautiful and exciting private blue voyage.